When I first designed the Panzer Grenadier game system, I had a couple of goals: I wanted it to be sure that all the combat arms were properly presented (so that the game would work just as well with no tanks on the board as it did for huge armored battles), and I wanted it to be a universal model that would work in any theater of World War II. 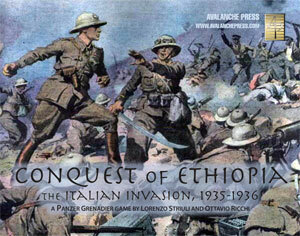 So that made publishing Lorenzo Striuli and Ottavio Ricchi’s design for Conquest of Ethiopia very satisfying. They managed to take the game system to a completely new theater, with different terrain and very different combatants than anything we’ve published before for Panzer Grenadier. While the Italian invasion of Ethiopia is rightly seen as a prelude to World War II, the early fighting usually represented the clash of well-armed tribes serving either the Italians or the Ethiopian central government. This sort of irregular warfare rarely involved much artillery, and though the Italians at times applied liberal air support the decisions usually came down to fierce hand-to-hand fighting. In Panzer Grenadier terms, that means light infantry maneuver through rough terrain, at times nearly a moonscape of rocky ground and sudden rises. These first ten scenarios of Conquest of Ethiopia are different from what the series has presented before, with high initiative ratings representing the energetic mobility displayed by both sides, but lower morale ratings than one usually finds in Panzer Grenadier games and not nearly as many leaders as long-time players may be used to deploying. That’s going to change the way the game is played, without changing the rules. That’s a sign of strong game design technique, and I think you’ll like Lorenzo and Ottavio’s work very much. Here’s a look at the first ten scenarios; you can see the others in Part Two, Part Three and Part Four. The Seraè Banda continued their advance, but their pace slowed with the increasingly difficult terrain. The following day they encountered the Daro Taclè fort manned by approximately 100 Ethiopian Imperial Irregulars, reinforced with a few machine guns. After the loss of Tenente Morgantini (the first Italian officer to die in the conflict), the Dubat of the Seraè Banda retreated with heavy losses (16 dead, 15 wounded, and 16 missing). The following day, at dawn, III Battalion Indigeni, supported by two light tanks, smashed the fort's garrison with very few losses (it's possible some of the Ethiopians retreated during the night). In the following days, the Italians and Ethiopians fought several more clashes that mostly resulted in Italian victories as their artillery often shattered the enemy well before the opposing troops came to blows. Once again the Italian screen of lightly-armed and fast-moving Bande run into Ethiopian opposition. This one’s just a small scenario; the Ethiopians are outnumbered pretty badly but they have a hilltop fort and pretty stout morale. This is a fine intro scenario, which is why it appears slightly out of chronological order. On the Ogaden plateau, in a disputed border area between the colony of Italian Somaliland and the Ethiopian province of Hararshe, Italian colonial troops (Dubats) and Ethiopian regulars and mercenaries conducted several days of show-of-force activities trying to intimidate each other. After some weeks of threat and counter-threat, shooting broke out, with each side blaming the other for starting hostilities. The outnumbered colonial Dubats fought bravely, assisted by a small number of Italian tanks and armored cars whose crews fought with fanatical zeal. The Ethiopian advance on the fort was thrown back, and during the night a lone L3/35 entered the Ethiopian cantonment, harassing the enemy until the following morning when it ran low on ammunition. The next day the Ethiopian Imperial troops retreated, leaving the mercenaries behind. Several months later this event served as the casus belli for the Italian invasion of Ethiopia. This one’s a kind of complicated scenario, so I shuffled it slightly further back in the order of appearance. That said, it’s a big scenario pretty much bursting with coolness: fanatic Italian tankers, Ethiopian mercenaries, Somali Dubats. In the first phase of Italian General Emilio De Bono’s offensive, only the II Corps experienced any real resistance, and several local Ethiopian leaders seriously considered defecting to the Italian side. The remaining local commanders opted to follow Emperor Haile Selassie's orders to delay the Italian advance in order to buy time for the slow general mobilization of the country. Later, they all united to strike the Italians. One the first notable clashes between Italian and Ethiopian troops came at Ramà in the province of Tigray. After a brief pause, the Seraè Banda - irregulars in Italian service - smashed the Ethiopian resistance with the support of two light tanks. As one of the most forward-deployed units of II Corps it continued to lead the advance, making use of its local knowledge. It’s another Bande battle (“Bande” are the troops, “Banda” is a unit of them), Eritrean irregulars in Italian service. The Italians are on the attack spearheaded by some very weak armor support – but the Ethiopians have no anti-tank weapons. This scenario also introduces Ambà, the Devil’s-Tower-like formations of Ethiopia that have their own special climbing rules. During the advance toward Adowa, the II Corps encountered several hundred soldiers of Ras Sejum (Ras is an aristocratic title similar to Duke). The Ras deployed his men only to slow the Italian advance, in accordance with Emperor Haile Selassie I’s orders to reserve most of his forces for the planned general counterattack. However, this defensive stance affronted the innate bravery of the Ethiopians, and led to occasional undesired heavy engagements when forces disregarded the Emperor's strategic priorities. The Ethiopians paid for their bravery with severe losses, but managed to stop this small sector of the Italian advance for almost a day. Colonel Fedor Evgenievich Konovaloff, a White Russian officer serving with the Ethiopian army, heard survivors describe the 70th Tuscan Infantry’s assault on their position as utterly fearless, with no regard for their own injured companions. Now the Italian regulars, both Metropolitan and Colonial, make their first appearance. They have a slight morale advantage and a definite edge in artillery, and they’re going to need them as they’re attacking a much larger Ethiopian force. During the second phase of General Emilio De Bono’s advance toward Macallè, several Eritrean Indigeni battalions patrolled the gaps between his major corps columns to secure the surrounding areas from the emerging guerrilla threat. During one of these actions, Ethiopian forces attacked two Indigeni battalions as they were encamping for the night. After a fast-moving skirmish, the Ethiopians irregular retreated. They lost about a third of their men, including prisoners, but inflicted a morale-boosting slap to the Italians. In this phase of the conflict these clearing actions played a significant role in assuring security for De Bono's forces. This is a short scenario, a close-quarters melee in the last hours of daylight. The Ethiopians have surprisingly high morale, but the Italians have numbers and firepower on their side. Numbers and firepower are good things to have in a fight. During the march toward Macallè, a Colonial troop column received the task to cover the right flank of the Eritrean Corps’ advance. During their march along the dry bed of the Enda River they ran headlong into an ambush set by the Degiac Cassa Sebhat force, equipped with several heavy machine guns. This would be the last major engagement before Marshal Badoglio replaced De Bono. The Ethiopians managed to stop the enemy column for an entire day. Both sides suffered heavy losses, and during the night Degiac Cassa Sebhat retreated his forces. The following day the Italian column sat in place suffering from logistical difficulties and recovering from the battle. However, the Regia Aeronautica managed to perform one of the first parachute re-supply operations in military history. Another day passed, and the column resumed its march. The Ethiopians have set up a roadblock (including a small ambush), and it’s up to the Italians to bop their way past. Eventually they’ll have numbers and firepower on their side, but morale is with the Ethiopians. Generale Rodolfo Graziani commanded the southern front of the Italian invasion of Ethiopia. Intended to be a defensive front, Graziani proposed other ideas and received permission from Rome to move offensively. The first actions on the southern front (the Somali front, where the Italians had to face some of the finest of Hailè Salassiè’s troops) were called “border corrections.” The Regia Aeronautica carried out almost all of the initial attacks, employing bombing and strafing runs that forced some Ethiopian forts and garrisons to surrender. The first real occasion Italian troops and the allied Sultan Olol Dinle’s private army had for measuring themselves against the brave enemy occurred on the 18th of October. The heavy Italian air support combined with the mud proved very effective in inhibiting the Ethiopian forces’ initiative. However, they displayed their bravery, managing to damage six Italian aircraft and heavily harass the Bande's advance throughout the day. Nevertheless, as night fell the Italian colonial troops forced the Ethiopians to retreat from the fort. However, Hamed Badil’s mercenaries resisted in the Gilde village until the following morning, holding up Olol Dinle’s dismounted cavalry. Not until II Bande Group pitched in did the standoff resolve itself. Badil, a cousin and long-time rival of Olol Dinle, managed to escape, but Dinle captured him a few days later. Dinle offered Badil a sumptuous tent, a fine dinner, and women for the evening. Later that night Badil's own brother strangled him on Olol Dinle’s orders. We shift to the Somali front, where the Italians are also screening their advance with swarms of irregular Bande plus some tough Somali warriors from a semi-independent allied sultanate. The Italians have numbers and initiative plus a lot of airpower; the Ethiopians have slightly better morale plus they have a fort. Heavy aerial attacks forced the unanticipated surrender of the Gorrahei Fort without any fighting against the Italian ground troops. The Maletti Column en route to take the fort found itself “unemployed,” and headquarters changed their mission to a reconnaissance in force. After a few successful minor engagements, Col. Pietro Maletti's men met a strong, well-equipped detachment of enemy forces. The Ethiopians deployed a few of their 20 handcrafted armored cars (partially manned by foreign military advisors) in the ensuing battle. The Italian armored force managed to disrupt their Ethiopian counterparts. Then, with the Dubats’ help, they smashed the enemy defensive points. The Ethiopian main force retreated to the eastern hill south of the wadi, leaving a handful of machine guns to provide covering fire. Then the tide of fortune turned. One L3/35 tank bogged down in a mud pond just in front of a Hotchkiss machine gun reputedly manned by Guangual Kolasè in person. All the efforts to recover the crew were fruitless, and the other two tanks broke down under fire trying to tow out the first tank. The Dubats tried several times to put the enemy machine gun out of action and save the isolated and wounded tank crews, but enemy snipers and machine gun fire killed or wounded enough men to drive them off. After several hours, a prisoner warned Maletti of the imminent arrival of massive Ethiopian reinforcements (a fabrication). Maletti believed the lie, or perhaps he just wanted an excuse to retreat his exhausted and wounded Dubat who had suffered 60 percent casualties. Maletti intended to come back during the night or the following day and rescue the isolated crews. However, as soon as the column left those unfortunate soldiers were captured by the Ethiopians and tortured. When Emperor Hailè Salassiè arrived in the area three days later for an inspection of the local commanders, he refused to spare the prisoners’ lives (as requested by some foreign advisors attached to his court). The condemned men spent several weeks in miserable conditions before finally being executed. Colonel Maletti survived this battle but would later die at the beginning of the 1940 British offensive in North Africa. Tank battle! Well, what passes for a tank battle in the Italo-Ethiopian War anyway, as the Ethiopians send out their small force of armored cars (actually rebuilt trucks) to do battle with Italian armored cars and tankettes. Plus Bande. Always with the Bande. There aren’t a lot of anti-tank weapons on the board, and those that are present aren’t very potent, so it’s not exactly the Battle of Kursk, East African style. In contrast with the Marshal Badoglio’s anticipation of enemy actions pivoting on Macallè, the Ethiopian counterattack began with broad infiltrations across a wide area covering the Tembien and Scirè regions. Ras Immirù possessed a well-equipped and well-led force on the left wing, and his superb campaign would prove to be one of the best moments for the Ethiopian leaders. His infiltrations and consequent series of small successful engagements worried the strong Italian advanced detachment deployed on Tacazzè River. The commander decided it was prudent to retreat, but found the only available route blocked by the Ethiopians. Major Luigi Criniti, commander of the Bande dell’Altopiano Group, launched his small fleet of L3/35 tanks in an attack without infantry support: a hopeless endeavor. The Ethiopians disabled all of them in brave close combat (placing big stones in the tracks, shooting throughout the sighting ports, setting fires on the engine gratings and so on). They also captured two tank crew prisoners who were treated well and survived the war. In return, Fitawrari Sciferra’s force suffered heavy losses, included the Sciferra himself. The Bande showed exceptional morale, probably sparked by knowledge that the Ethiopians would slaughter any who surrendered, and moved forward to support the disabled tanks. They found themselves encircled by pursuing Ethiopian units that had forced their retreat the previous day and chased them across the Mai Timchet ford. Realizing their encirclement, some of the Bande began to surrender, but were horrified when they realized that the Ethiopians did not understand or honor their hands-up gesture and began killing them. Criniti began to play his gramophone (Schubert’s Unfinished Symphony) and headed a bayonet assault to break the encirclement. Although injured twice, the Major and his men broke out and retreated rapidly toward Enda Salassiè, having lost over half their numbers. A bayonet charge with symphonic accompaniment. Is there really anything else to say? Although effective against fixed positions, the Italian air campaign proved unable to inhibit Ethiopian infiltration tactics, leading to sizable Ethiopian forces maneuvering against Italian positions. However, the Regia Aeronautica excelled at reconnaissance, alerting the Italian High Command so they could quickly dispatch strong reinforcements where needed. East of Ras Immirù’s forces, Ras Sejum began a series of violent attacks against a Blackshirt Group led by Console Generale Filippo Diamanti. The most important actions by Ras Sejum took place in the Abbi Addi area, with the first big attack carried out at Debra Ambà. Thanks to those eyes in the sky, Diamanti and his men were already in place. The day before the battle, the Ethiopians in the fort had sporadically harassed the Italians deployed on the Ambà with intense rifle fire. Feeling vulnerable, the Italians planned an attack to dislodge the Ethiopians and secure the area. A large detachment of Ethiopians intercepted the Italians as they approached Sicomoro Fort leading to a drawn-out ten-hour battle. The Ethiopians eventually retreated with heavy losses while inflicting only light casualties on the Italians thanks to weak firepower and a lack of many machine guns. Nevertheless, the action worried the Italian High Command who sent heavy reinforcements to the Abbi Addi area during the night and over the following days. The Blackshirts make their first appearance, and they’re not half bad. The Ethiopians are inspired, with sky-high morale and not much more. The Blackshirts have an edge in firepower, even numbers and some artillery support.